The move by FEMA to enforce the June 1 eviction date for Gulf Region residents who live in temporary trailers not only lacks basic compassion but is also a derogation of the government’s responsibilities to uphold fundamental human rights. If FEMA moves forward with the Bush administration’s plan to forcefully evict people living in temporary housing, it will make a mockery of the Gulf Region recovery promised by President Obama and Congress. Earnest Hammond is a 70-year-old retired truck driver who received no assistance after Hurricane Katrina destroyed his home. 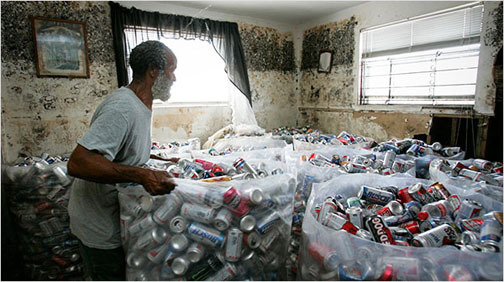 He took matters into his own hands and, by collecting aluminum cans, raised thousands of dollars to repair his badly damaged house. Instead of carrying out the former administration’s callous plan for eviction, the Obama administration and Congress should apply the United Nations’ Guiding Principles on Internal Displacement, a human rights policy that, for several years, has guided our government in providing temporary and permanent homes for people in foreign countries who become displaced by earthquakes, typhoons and flooding. Hurricane Katrina displaced over a million people, many of whom have yet to fully recover as a result of the government’s failure to honor the U.N. Guiding Principles and human rights treaties ratified in the U.S. Gulf Region residents, both renters and homeowners, have worked tirelessly to access safe, permanent housing and should have the support that our government provides under basic standards of human rights law. The US Human Rights Network is made up of more than 250 organizations and over a thousand individuals working to bring the United States into compliance with the Universal Declaration of Human Rights and other internationally recognized human rights instruments by applying the standards and principles within those instruments to domestic and foreign policy priorities. To learn more, visit www.ushrnetwork.org. On June 1, the first day of hurricane season, Advancement Project, as part of a coalition of 200 Gulf Coast and national allied groups, rallied outside the Federal Emergency Management Agency (FEMA) to demand that the Obama administration stop FEMA’s plan to evict thousands of survivors of Hurricanes Katrina and Rita from FEMA trailers. overhauling the Stafford Act in compliance with the United Nations’ Guiding Principals on Internal Displacement. It seems that our pleas to stop the evictions were heard. On June 3, the White House announced that trailer residents and Gulf Coast organizations providing assistance to these residents would be able to buy FEMA trailers for $5 or less, according to the New York Times. In addition, the Department of Housing and Urban Development offered to give the 3,450 families residing in trailers priority for $50 million in housing vouchers. Advancement Project welcomes these developments. 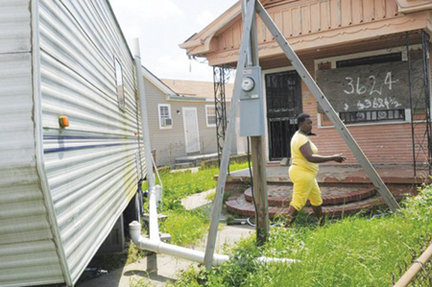 However, much more needs to be done to resolve the problems caused by Katrina and Rita and past governmental neglect. Although the Obama administration inherited these problems, it is incumbent on the new administration to correct them. Advancement Project is encouraged by the fact that the new administration seems responsive to the ongoing needs of the Gulf Coast. We call upon the government to now come up with a comprehensive plan for recovery and justice. Contact Advancement Project at 1220 L Street, N.W., Suite 850, Washington, DC 20005, (202) 728-9557, ap@advancementproject.org or www.advancementproject.org. Indeed an important step taken forward.